Front: The Scottish Cat Club, Instituted 1894. Shows image of longhair and shorthair cat. Engraved on back. "For the Best Cat, Won by TIM JIM MISS MARY, Edinburgh May 1895"
Acquisition Donated to The CFA Foundation by an anonymous donor, September 2014. 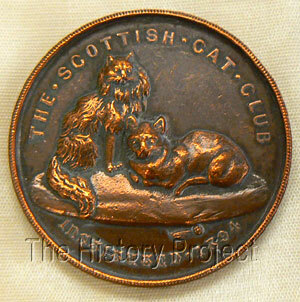 The Scottish Cat Club, based in Edinburgh, Scotland, was started in 1894. The club remains active to this day, affiliated with the Governing Council of the Cat Fancy (GCCF). This silver medal was awarded at what may have been their first show in May, 1895. The winner of the medal was a cat of unknown breed, named 'Tim Jim' with the owner most likely 'Miss Mary'. No information for this cat has been found in any registration data, pedigree database or stud book. Research (thank you, Amanda Bright) has found a report in the Edinburgh Evening News, May 29, 1895 that lists the placements awarded at the Edinburgh Kennel Club Show which was held at the Waverly Market and included dogs, cats, rabbits, and cavies. One cat winner in the "Males, short-haired, other than foreign" category is owned by Miss Mary Hunter of Corstophine (an area within Edinburgh). There is a distinct possibility that this may be the winner of this medal. In addition to the engraved silver medal, the CFA Foundation also owns a bronze medal of the exact same design. 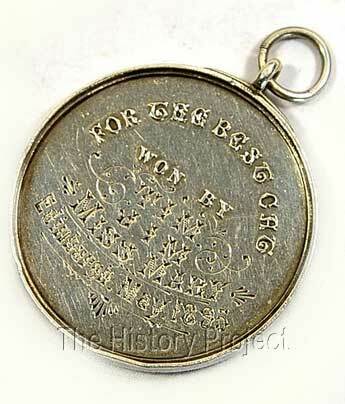 This medal is undated, and there is no engraving on the back to indicate the winner. 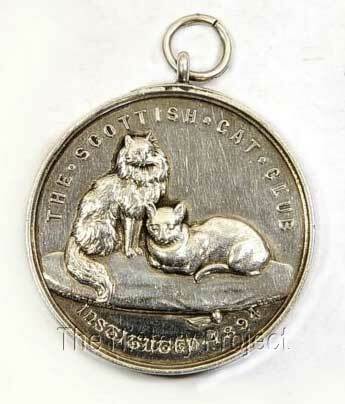 Bronze Medal, Scottish Cat Club, undated. Donated by The Harrison Weir Collection.